Nicole Krauss has 1 media appearance. Writopia Lab celebrates with readings and performances by bestselling acclaimed writer Nicole Krauss, award-winning writer and journalist Stephen Dubner and poet, author and playwright Reg E. Gaines. Please join us for Great House by Nicole Krauss. New members are always welcome! April's book is The History of Love. Nicole Krauss reads from Great House. Nicole Krauss discusses Great House. Nicole Krauss, The History of Love. Nicole Krauss , Man Walks Into a Room. Room's new book club will be meeting to discuss "Man Walks Into a Room" by Nicole Krauss. This book club will be focusing on contemporary fiction. New members are welcome! E-mail room@chorus.net for more info or just show up! 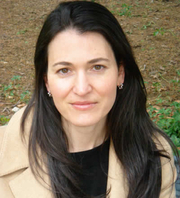 Nicole Krauss is currently considered a "single author." If one or more works are by a distinct, homonymous authors, go ahead and split the author. Nicole Krauss is composed of 5 names. You can examine and separate out names.